You almost never hear about the most important thing in science. In previous posts, I’ve looked at how Neil deGrasse Tyson’s Cosmos series treated science literacy and inspiration. Today I explore how Cosmos delved into something rare: the process of science. In Cosmos’s final episode, Tyson put forth some simple rules for doing science: question authority, question yourself, don’t think something because you want it to be true, test ideas and follow the evidence where it leads rather than where you wish it to go, and always remember that you most likely are wrong. In Cosmos, Neil deGrasse Tyson used the example of dark matter to say that the term was only a “codeword for our ignorance” about the nature of the universe. Much is unknown, and much is incompletely known, and we often don’t know what we don’t know. Scientists just have to live with this. All conclusions are tentative and subject to revision if new data or theory contradicts previous understandings. Reality is just messy like that. How different this is from other human endeavors, such as politics. You’ll never hear political leaders or talking heads admit they don’t know something, or need more time to come to a reasoned conclusion. That is simply not how discourse works in politics, the media, economics, or courtrooms, where saying you don’t know is often viewed as a sign of unacceptable weakness. Long ago, in another life when I worked retail, a manager once reprimanded me for saying “I don’t know” to a customer, insisting that I just make up an answer to close the sale (which is something to keep in mind next time you ask a sales clerk about a potential purchase). In the world outside of science, ignorance and uncertainty are loathed. (If you crave certainty, there are plenty of groups eager to take your money.) But in the world of science, you have to adapt to pervasive uncertainty. When I teach introductory geology courses, I find myself saying, “I don’t know—in fact, no one knows,” almost every day in response to good questions from students. 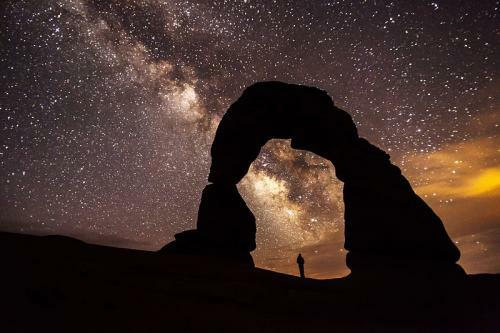 Just this week, a new paper in Nature Geoscience reported surprising experimental findings about how structures such as arches form (see above for a photograph of Delicate Arch). I’ve been asked by students many times about the formation of such features, and have always had to admit that there is great uncertainty among geologists about the exact mechanisms. Now, thanks to this research, we’re a step closer to giving better answers. That’s how science should work—by the admission of ignorance followed by investigation, rather than making up answers to gain or keep social status. Questioning our own certainty is also a step toward questioning the authority of others, which is why science can be challenging and provocative in its ability to “undermine fanaticism,” as Tyson put it. The very first episode of Cosmos told the story of Bruno, who wasn’t a scientist but who challenged authorities about many things, including the cosmological model of the day, and was burned at the stake for his trouble. (That Sacha Baron Cohen movie Brüno was pretty unfunny, but the punishment of burning at the stake seems a bit too far.) Many reacted grumpily to this first episode, interpreting it as an attack on religion without understanding the broader point: power is always threatened by new ideas, and as the Scientific Revolution unfolded, ideas backed by the developing process of science would prove disruptive. We saw this theme play out in other topics in Cosmos: the long-delayed acceptance of plate tectonics, the discovery of widespread lead pollution from gasoline, the dawning comprehension that humans are causing climate change. Indeed, acknowledgment of climate change is still fiercely resisted by well-funded groups who exploit the predilection of media to manufacture drama by presenting every issue as a partisan debate. In addition to portraying science as a process which assumes the ignorance of experts and which creates potent challenges to those in power, Tyson’s Cosmos also showed science as serendipitous, full of “that’s funny” moments when one avenue of research led to something completely unexpected. Joseph Fraunhofer did not set out to find a way to measure the atomic composition of distant stars when he examined lines in a spectrum of light, but that’s exactly what he accomplished. When Clair Patterson created the world’s first clean room, he wasn’t trying to research the harmfulness of lead; his intention was to discover the age of the Earth. He serendipitously did both. It’s important to understand that science frequently advances in nonlinear, unexpected directions. Scientists don’t always know where a line of investigation will go, much less what “practical use” their discoveries might have. Sometimes there is concerted resistance to new ideas. And even the greatest scientific experts can get it wrong. These are all important lessons about the nature of science, and Cosmos did a great job conveying them to audiences. By showing not just the results, but the process—by showing science as an activity rather than a list of facts to be memorized—Cosmos allowed the public a much-needed look under the hood into science itself. This accomplishment may be the lasting legacy of Cosmos.